WWE SuperCard App Announced – Releases TODAY! 2K have just announced a brand-new collectible card game for download on the iOS App Store, Google Play Store and Amazon Appstore. WWE SuperCard, developed by Cat Daddy Games (a 2K Studio), brings the action-packed entertainment of WWE to your mobile, challenging you to build teams of WWE Superstars, Divas and Legends. Train your team to their full potential, then enter various PvP card battling match types, plus test your luck in high-stakes 16 player multi-day King of the Ring tournament action. The game is free to play – you can earn cards by playing in exhibition mode to build a better deck, however you may also enhance your team by purchasing individual card packs. With 400 collectible cards available in seven different rarity levels, WWE SuperCard delivers an extensive array of collectible content with high replay value. 2K is promising to regularly update the available roster by continually expanding the card base. Players collect their favorite WWE Superstars, Divas, Legends and more while building their rosters to compete online in multiple game modes and match types. When you first play the game you’ll be given 14 cards to start you off. 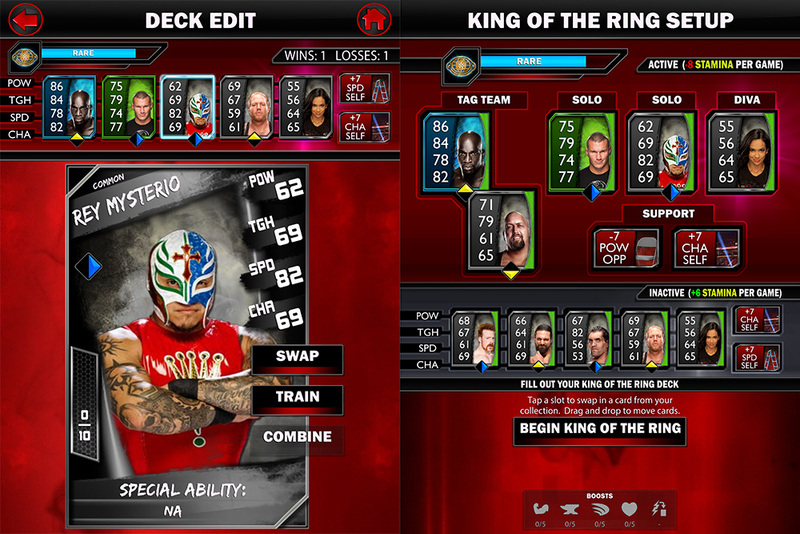 Players will take individual Superstars, tag teams or five-person teams online against other players to test their skills, while winning matches enables new cards to join their rosters. 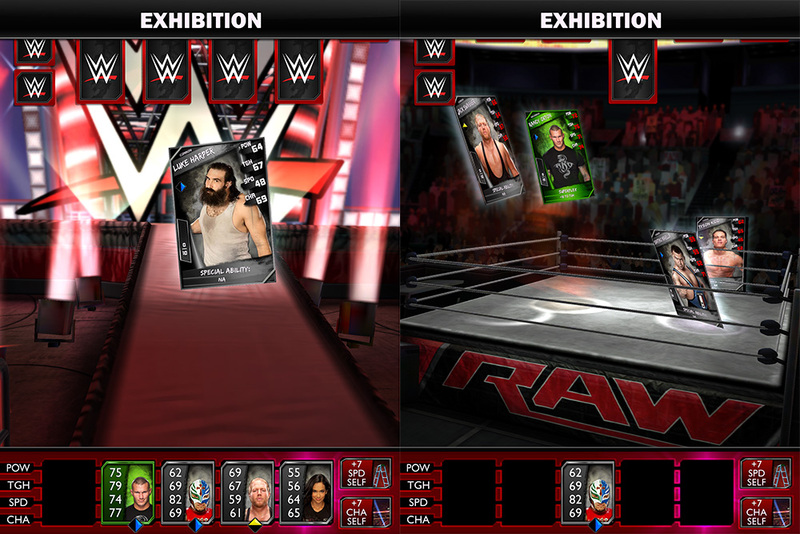 Players will discover cards of different rarities and use them to assemble the ultimate WWE roster. Training and combining cards upgrades the cards’ levels and unlocks their full potential. Build an exhibition deck and play this mode to unlock new cards. Exhibition games award ‘Picks’, 2 for a win and 1 for a loss. Each pick removes one card from the board. 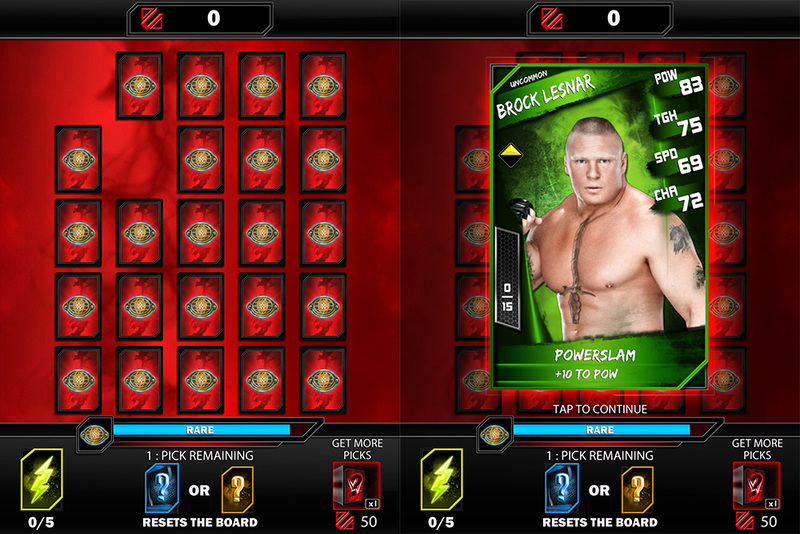 The board will reset on selecting a boost or any card rare or better. Support cards such as a chair, table, ladder etc can be used boost a superstar’s stats, e.g. +7 Speed or +7 Charisma. Players will put their teams to the ultimate test by playing through full seasons. High levels of participation will result in higher rankings and bigger rewards. In King of the Ring, you’re put up against 15 other players to win the championship! Matches are simulated in this mode. 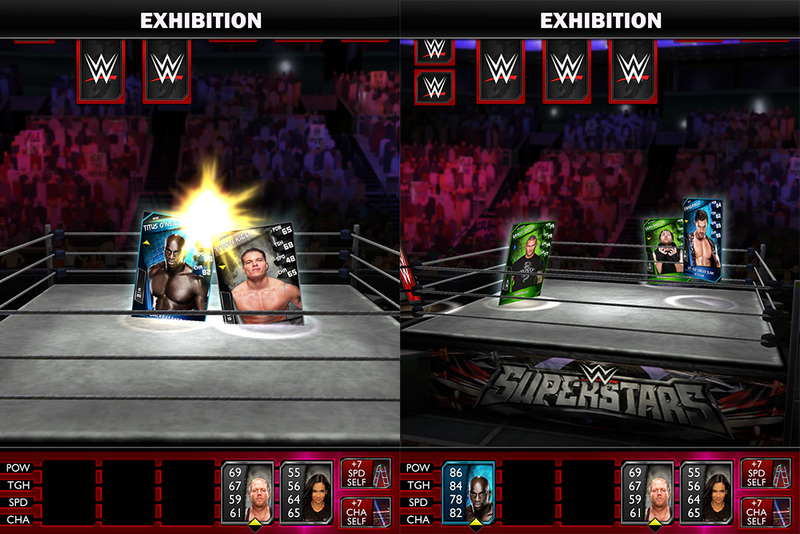 During active times your ‘King of the Ring Deck’ is in the ring, and during inactive times you can manage your superstars for the next game. Active superstars lose stamina each game, inactive ones gain stamina back. Drag & drop ‘Energy’ cards collected from Exhibition games to restore a superstar’s stamina. The strength of your King of the Ring deck changes your ‘King of the Ring Tier Rating’. This determines the rewards you will be competing for. ALIGNMENTS: Cards with complementing alignments receive a stat bonus when played together as a tag team. Conflicting alignments however will receive a penalty. The WWE SuperCard universe will continually expand with roster updates, enabling players to routinely discover new cards. Download today from the iOS App Store, Google Play Store & Amazon Appstore.